Nowadays modern trekking umbrellas are part of every backpacker and hiker ´s basic equipment. The advantages are obvious: No more heat-induced sweating in so called breathable clothes, compact when closed and easy to store – in other words: you can always rely on a proper trekking umbrella if it starts raining or against heat and UV radiation. 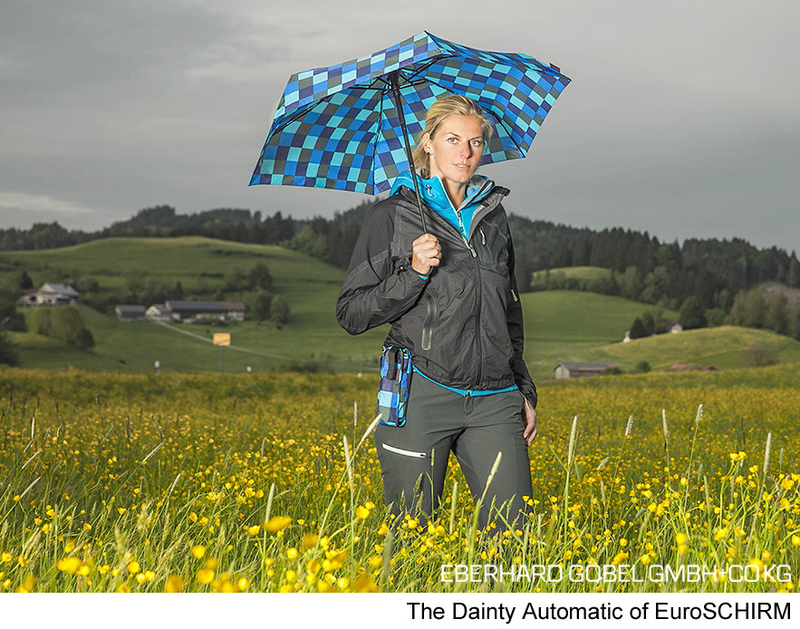 EBERHARD GOEBEL GmbH+Co from Germany is the leading producer of such umbrellas – internationally known under the brand name EuroSCHIRM. Meanwhile the range of products comprises many different models, each with a special feature or innovation. The latest innovation of EuroSCHIRM is the DAINTY AUTOMATIC which is strong, small, and fully automatic. This new trekking umbrella convinces with its extremely compact and flat condition when closed – only around 22cm short and 3,5cm flat. When opened, the canopy surprises with its large size, the diameter comes with around 93cm. Reliable automatic open and close function, with strong metal shaft (4 sections), corrosion resistant. 6 highly flexible ribs with a combination of metal and fiberglass make sure that the umbrella will not break easily even the wind is blowing harder. The handle is made of ABS and with Senosoft coating, including a practical wrist loop with adjustable length. The fabric is a special and very lightweight Polyester, tear resistant and Teflon®* treated. Double stitched seams between the panels make the umbrella even stronger. Extra short tips reduce injuries. Robust Nylon sleeve case with carrying loop that allows it to be attached to your backpack or belt easily as well as an aluminium-carabiner for alternative mounting to the carrying loop. Eberhard Goebel GmbH + Co KG is developing special umbrellas for demanding applications. These special trekking and golf umbrellas are unique in Europe and are made from the newest high tech materials and offer the best functionality that is possible and appropriate for the intended use and according to the current state of technology. Their workmanship is exceptional and they are extremely stable and nearly unbreakable. The special know-how of the internationally, and especially in the U.S. and Asia very successfully operating company out of Ulm is based on the rich experience of a family business that is developing and producing high-quality umbrellas for almost 90 years.